Global climate change is considered one of the most urgent environmental problems. The main negative impact on climate change is the emission of greenhouse gases (CO2, CH4, N2O), which is directly or indirectly due to the burning of non-renewable resources (carbon bound in mineral oil or coal). Tropical rainforests hold the biggest living biomass on very delicate soils that may lose their fertility completely when clear cutting is performed as in recent decades. Agriculture contributes to over 20 percent of global anthropogenic greenhouse gas emissions89 . Moreover, agricultural intensification has had major detrimental impacts on the terrestrial and aquatic ecosystems of the world. The doubling of production during the last 35 years was associated with a 6.9 fold increase in nitrogen fertilization, 3.5 fold increase in phosphorus fertilization and a 1.7 fold increase in irrigated land90. Agriculture, however, is not only contributing to global warming, but is also affected by it to a major extent. According to Burdick (1994) increasing global warming will shift cultivation zones polewards, plant growth and production being jeopardized by changes in the distribution of rainfall, the increase of UV-B radiation, and changes in the chemical composition of the atmosphere. In regions with continental climate, soils are subject to desiccation, meaning climate change will aggravate problems of salinity, erosion, and desertification. Extreme climatic events will occur more frequently. Pests and diseases favoured by a warmer climate will continue to proliferate. All these factors will have negative impacts on agricultural yields91. Since climate change has a direct impact on agriculture, environmentally sound farming methods need to be developed and practised. Organic agriculture not only enables ecosystems to better adjust to the effects of climate change but also offers a major potential to reduce the emissions of agricultural greenhouse gases92. Moreover, mixed farming and the diversity of organic crop rotations are protecting the fragile soil surface and may even counteract climate change by restoring the organic matter content93. The carbon sink idea of the Kyoto Protocol (Article 3.4) may therefore partly be accomplished efficiently by organic agriculture. 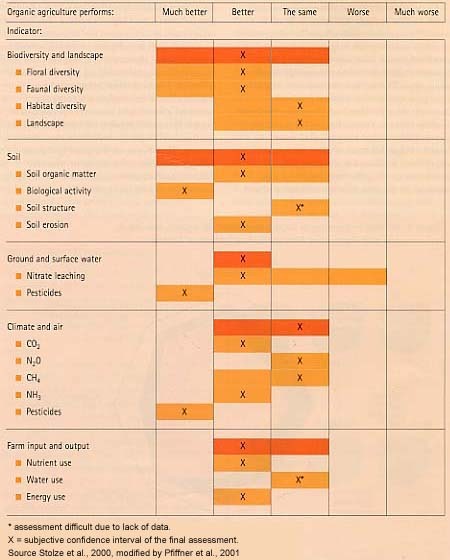 The potential pathways and the role of organic agriculture in counteracting global climatic change are summarized in Table 6. (iii) Promotion of sustainable forms of agriculture in light of climate change considerations. Article 3.4: ...each Party included in Annex I shall provide... data to establish its level of carbon stocks in 1990 and to enable an estimate to be made of its changes in carbon stocks in subsequent years. ...modalities, rules and guidelines as to how, and which, additional human-induced activities related to changes in greenhouse gas emissions by sources and removals by sinks in the agricultural soils and the land-use change and forestry ...shall be added or subtracted. Cultivation of land with the clear cutting of natural forests has been the main CO2 emission that may be ascribed to the agricultural sector94. Soil processes with respect to carbon are characterized by the dynamic equilibrium of input (photosynthesis) and output (respiration). Principally, all the organic matter entering the soil is mineralized. Changing environmental conditions and land management may induce a temporary or definite change of the equilibrium to a new level that is considered stable. 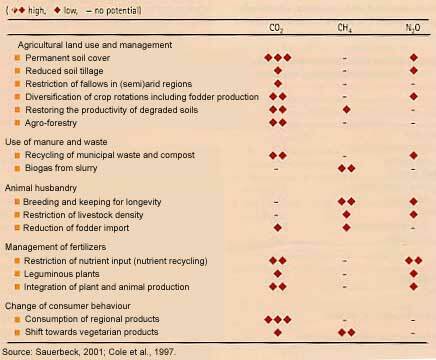 The following two sections explain the role of organic agriculture with respect to carbon stocks and CO2 emission. CO2 emissions per hectare of organic agriculture systems are 48 to 66 percent lower than in conventional systems. Conversion of natural vegetation to agriculture is a major source of CO2, not only due to losses of plant biomass but also, increased decomposition of soil organic matter caused by disturbance and energy costs of various agricultural practices such as fertilization and irrigation. CO2 emissions from the agricultural sector represent 21-25 percent of total CO2 emissions, due to fossil fuels used on farms, shifting patterns of cultivation and chiefly, deforestation. Appropriate management practices could increase carbon sinks and energy efficiency improvements and production of energy from crops and residues would result in a further mitigation potential, or a cumulative carbon storage95. Source: Haas and Köpke, 1994. *Manure is not included. In order to compare farming systems, they are subdivided into emissions due to burning of oil and fuel (direct energy) and the use of oil and fuel for the production and transport of fertilizers, machinery and synthetic pesticides (indirect energy). the lower use of high energy consuming feedstuff. In organic agriculture, almost 70 percent of the CO2 was due to fuel consumption and the production of machinery, while in conventional systems 75 percent of the CO2 emissions are ascribed to N-fertilizers, feedstuff and fuels98. Soil carbon levels have decreased under agricultural land use99. Sustainable agricultural strategies comprising recycling of organic matter, tightening internal nutrient cycles, and low- or no-tillage practices may rebuild organic matter levels and reduce losses from the system. Mixed farming with manure amendment leads to higher organic matter levels in soil. Combined with other organic agriculture techniques Drinkwater et al. (1998) showed, in a long-term experiment, a considerable gain in soil organic matter compared to a conventional system at comparable yield. Many long-term experiments in the world support the cognition that organic fertilization (animal manure, green manure, catch and cover crops) rebuild soil organic matter100. The accumulation of organic matter in the soil is restricted by soil type, climate and management factors and will reach a certain saturation level. Haas and Köpke (1994) calculated that, despite generally lower crop yields, plant productivity in organic agriculture accounts for almost the same organic matter return as in a conventional system (Table 5). This is due to the more diverse crop rotations and the longer period the soil is covered by plants. On the other hand, organic crop yields in developing countries may be considerably higher than the national average, which has implications on organic matter return and carbon sinks102. A 20 percent increase in soil organic matter as a result of organic agriculture would result in an estimated amount of 9 tonnes carbon per ha, which is in line with the results over a 15-year period103. Smith et al. (1997) calculated a considerable potential increase of soil carbon when manure, straw-recycling, minimal tillage, reforestation and energy-saving plant production are combined. Nitrous oxide emissions not only contribute severely to the greenhouse effect but also to the depletion of stratospheric ozone. Almost 90 percent of the global atmospheric N2O is formed during the microbial transformation of nitrate (NO3-) and ammonia (NH4+) in soils and water. Globally, agriculture contributes to 65-80 percent of total N2O, mainly from nitrogenous fertilizers on cultivated soils, cattle and feedlots. In OECD countries the agricultural contribution to N2O emissions is estimated at 58 percent104. N2O emissions from soils are due to the unproductive loss of mobile N. Any nitrogen input (mineral and organic fertilizers, biologically fixed N, crop residues) and also the mineralization of nitrogen compounds in soils rich in organic matter contribute to the emission of N2O. Especially in agricultural soils elevated N2O production depends on the nitrogen fertilization level105. The above-mentioned inputs are proposed as determinants of N2O emissions by the Inter-Governmental Panel on Climate Change. Tropical ecosystems, currently an important source of N2O (and NO) are often phosporus-limited rather than being N-limited like the Northern hemispheric terrestrial ecosystems. Nitrogen fertilizer inputs into these phosphorus-limited ecosystems generate N2O (and NO) fluxes that are 10 to 100 times greater than the same fertilizer addition to nearby N-limited ecosystems106. the permanent plant cover in organic systems which results in a more efficient uptake of mobile nitrogen in soils, thus reducing the potential and risk for N2O emissions. As Tilman (1998) points out "sustainable and productive ecosystems have tight internal cycling of nutrients, a lesson that agriculture must relearn". Agriculture is believed to account for roughly two-thirds of the total man-made CH4108 mainly from paddy rice fields, burning of biomass and ruminants (enteric fermentation and animal waste treatment). Aerobic agricultural soils, however, are considered sinks for atmospheric CH4. Fertilization with mineral nitrogen has been shown to inhibit CH4-oxidation in soils. The lower N-fertilization level in organic agriculture may therefore exhibit an advantage for CH4-oxidation. However, no data exist on the effects of organic agriculture on methane emissions. The emission of methane by ruminants is probably not affected by organic production. The higher proportion and lower productivity of ruminants in organic agriculture may, however, lead to slightly higher emissions of CH4. On the other hand, standards and breeding programmes aim at longevity in order to prolong the productive period in relation to the unproductive life of young cattle. Correspondingly the "unproductive" CH4-emission of calves and heifers may be reduced. Organic agriculture not only enables ecosystems to better adjust to the effects of climate change but also offers a major potential to reduce the emissions of agricultural greenhouse gases. The degradation of drylands is called desertification. Desertification is caused by overcultivation, overgrazing and deforestation and results in soil exhaustion and soil erosion. It diminishes soil productivity, reduces food production, deprives the land of its vegetative cover, and negatively impacts areas not directly affected by its symptoms, by causing floods, soil salinization, deterioration of water quality, and silting of rivers, streams and reservoirs109. Organically-managed soils have a high potential to counter soil degradation as they are more resilient both to water stress and to nutrient loss. Organically-managed soils have a high potential to counter soil degradation as they are more resilient both to water stress and to nutrient loss. Organic farmers feed their soils with organic fertilizers, and they can thus enhance degraded and problematic soils. The water and nutrient retention capacity is increased thanks to a high level of organic matter and permanent soil cover. Micro-organisms have a good feeding base and create a stable soil structure. Due to the resulting high moisture retention capacity the amount of water needed for irrigation can be reduced substantially. There is little scientific evidence demonstrating organic agriculture's potential for combating desert-ification but several practical examples of organic agriculture systems in arid areas show how organic agriculture can help bring degraded lands back to fertility. A SEKEM biodynamic farm in Egypt cultivates 70 hectares of desert near Cairo. By using organic and biodynamic agricultural methods (composting, mulching, cover cropping) the desert sands were converted into fertile soil, supporting livestock and bees. Organic agriculture can create suitable micro-climates in dry areas. For example in Kenya, the International Centre for Research in Agroforestry runs organic agriculture projects to fight drought110. Agro-forestry generates multiple benefits, including erosion control and moisture retention. In Tanzania, the Chagga home gardens on the slopes of Mount Kilimanjaro, where certified organic coffee is produced, provide an excellent example of agroforestry. The system includes a diversity of cash and subsistence crops (e.g. bananas, coffee, yams, and beans) as well as livestock. Cattle and pigs are kept in stables ("zero grazing") and manure is recycled as fertilizer. The home gardens are designed to maximise diversity. Elaborate patterns of vertical zonation provide a range of sunny and cooler conditions for different species111. Organic agriculture can counter erosion successfully. While in conventional agriculture in the tropics even flat soil gets eroded due to the use of herbicides and the lack of soil cover, in organic agriculture permanent soil cover is an intrinsic part the system. In trials on a Cuban citrus plantation, the Cuban Citrus Institute and Swiss FiBL use Teranamus labialis, Arachis pintoi, Neonotonia wightii and other legumes. These locally-adapted leguminous crops can help restore degraded soils very fast, successfully suppress weed, fix nitrogen and prevent erosion. FiBL-experiments have also shown that cover crops do not compete with the main crops for nutrients or water. The precondition is, however, that the system be properly set up and adapted to soil and climatic conditions (e.g. FiBL sandwich-system; see Box 13). Soil life is enormously enhanced, and water retention capacity is increased. The cover crop plants also serve as habitats for predators. The sandwich-system was developed by the Swiss Research Institute for Organic Farming, FiBL. It consists of a small strip with cover crops directly under the tree strip. Left and right of the cover strip the soil is tilled with relatively simple tools. Thus the local amount of weed-free soil is the same as with tillage of the whole tree strip. This system supports a fully organic nutrition concept (efficient application of compost on tilled strips). 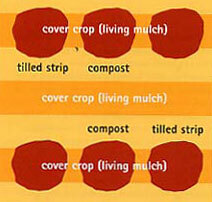 Compost and fertilizers are applied mechanically in the tilled strips and tilled 5 cm into the soil. The alleyway is covered by a leguminous cover-crop. In dry areas it is often not possible to have a permanent crop cover. In these areas it is therefore recommended to have a green cover crop during the rainy season which should be supplemented with dead mulch. The advantage of this system is that it achieves several aims of organic agriculture. Soil cover with specially selected valuable crops, avoidance of erosion and desiccation, target-oriented organic fertilization, avoidance of competition for water in the area of the fine roots. Organic agriculture can also counter salinization problems. The Fazenda Tamanduà in Brazil is situated in an area severely affected by salinization caused by inappropriate irrigation techniques. It is a certified organic farm with more than 3 000 hectares of which 650 hectares are cropped with mango trees. Due to the arid conditions, irrigation is the prerequisite to agricultural production. Conventional agriculture in the area uses the water from the rivers and causes further salinization by over-irrigation with already salinated water. Fazenda Tamanduà limits its water use to rain water, which is collected in rainwater collection basins, thus avoiding the depletion of the water resources. At the same time the salinization of soils is considerably reduced. Fertilization regimes include grazing of cattle under mango trees as well as application of composted manure. The organic substance acts like a sponge in the soil, and fields thus fertilized have a higher moisture retention capacity and therefore need less irrigation. Even though the adoption of organic agriculture seems a feasible alternative in arid areas, there is a range of constraints to adopting organic agriculture systems or even individual techniques. These include a lack of knowledge, lack of organic materials, insecure land tenure, the perception of organic agriculture as being old fashioned and the fact that extension services promote chemical farming. The promotion of organic agriculture through education and training, in countries suffering desertification, could be a key to bringing degraded land back into production. 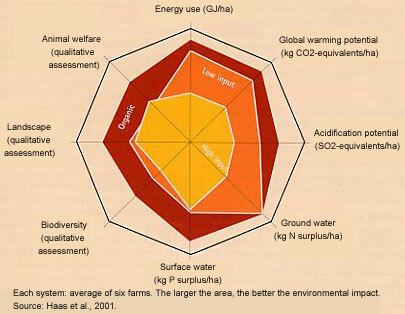 Comprehensive environmental impact assessments of agriculture can be assessed by using the OECD indicator categories. One example is the life cycle assessment of dairy farm production systems undertaken by Haas et al. (2001). The authors compared three dairy farm production systems of the Bavarian Alps: organic, low-input conventional, and high input conventional. Figure 4 presents the results related to the area. Organic agriculture showed the best results in all indicator categories: biotic and abiotic impacts, landscape and animal welfare. Another study compared organic, conventional and integrated apple production systems. The yields were similar in all three systems. The organic and the integrated system had higher soil quality and potentially lower negative environmental impact. The organic system was more profitable and used energy more efficiently than the other systems. Significant differences were found between the three apple production systems considering environmental impacts of pesticide use. Organic apple production achieved a 4.7 times better rating than integrated production and a 6.2 better rating than conventional production112. Another example of a comprehensive environmental impact assessment is given by Stolze et al. (2000). Table 7 presents the evaluation of almost 400 studies comparing organic with conventional or integrated farming in Europe. The results show the final average assessment and the confidence interval. Compared to conventional agriculture, organic agriculture in most categories performs better, or much better, in terms of environmental impact. Organic matter content is usually higher in organically-managed soils, indicating higher fertility and stability of organic soils as well as moisture retention capacity, which reduce the risk of erosion and desertification. Organically-farmed soils have significantly higher biological activity and a higher total mass of micro-organisms, making for more rapid nutrients recycling and improved soil structure. While the proportion of soluble nutrient fractions is lower on organically managed soils, there is no decrease in organic yields since higher biological activity and higher mycorrhizal root colonization counteract nutrient deficiency. Organic agriculture poses no risk of ground and surface water pollution through synthetic pesticides. Nitrate leaching rates per hectare are significantly lower in organic agriculture compared to conventional systems. Organic agriculture enables ecosystems to better adjust to the effects of climate change and has a major potential for reducing agricultural greenhouse gas emissions. Organic agricultural strategies, by recycling organic matter and tightening internal nutrient cycles, contribute to carbon sequestration. Organic agriculture performs better than conventional agriculture on a per hectare scale, both with respect to direct energy consumption (fuel and oil) and indirect consumption (synthetic fertilizers and pesticides). Efficiency of energy use of organic farms is high. Agriculture genetic resources, including also insects and micro-organisms, have all been shown to increase when land is farmed organically. Wild flora and fauna within and around organic farms are more diverse and abundant than in conventional or integrated agriculture. Organic agriculture offers vast food resources and shelter for beneficial arthropods and birds, thus contributing to natural pest control. Organic agriculture contributes to the conservation and survival of pollinators, thanks to the banning of synthetic chemical pesticides and herbicides and the enhanced ecosystem diversity. Organic agriculture systems create diversified landscapes, which contributes to functional diversity and aesthetical values. The establishment of semi-natural habitats within organic systems and the avoidance of pesticide use contribute to maintaining the biological connectivity and the larger ecological web, which benefit both agriculture and nature conservation. As a final assessment, it can be stated that well managed organic agriculture leads to more favourable conditions at all environmental levels. Organic agriculture counteracts resource depletion (soil, water, energy, nutrients), contributes positively to the problems associated with climate change and desertification and can help to maintain and enhance biodiversity at a global scale. Scientific evidence of the environmental benefits of organic agriculture for the Southern Hemisphere is rare, but many experiences suggest that the points listed above also apply to the tropics and subtropics. There is urgent need, however, to investigate the interactions between organic agriculture practices and natural resources dynamics in these areas. As a final assessment, it can be stated that well managed organic agriculture leads to more favourable conditions at all environmental levels. 91 Reilly et al., 1996. 93 Haas and Köpke, 1994. 96 Burdick, 1994; Stolze et al., 2000; Haas and Köpke, 1994. 97 Haas and Köpke, 1994; Stolze et al., 2000. 98 Haas et al., 1995. 100 Tilman, 1998; Bockisch, 2000. 101 Catch crops (intercrops) are sown after the harvest of the main crop in order to capture the nutrients and to provide soil cover. They can also be sown between the main crop. 102 Busemann and Heusinger, 1999. 103 Drinkwater et al., 1998. 107 Köpke and Haas, 1994; Stolze et al., 2000. 108 Watson et al., 1996. 111 Parrott and Marsden, 2002. 112 Reganold et al., 2001.